YAAHHHHH! I finished a new pattern! It's an early 1940's "Glamour Girl Dress" from Folkwear Patterns at www.folkwear.com. Of course I made a LOT of major changes to the pattern. I used a knit fabric which means I needed to sew small and I took a lot off of the bodice and length. These vintage dresses are so cool because of the attention to detail such as the gathers on the sleeves. And the graceful neckline that makes a little collar in the back. I LOVE this soft four-way stretch cotton knit with sweet little turquoise hummingbirds with pink beaks that I got at www.girlcharlee.com. I shortened the bodice by 2 inches, took about 4 inches off the shortest length offered on the pattern, and narrowed the front bodice about 2 and a half inches. I cut off the part of the front midriff that ties and made it into two separate pieces so that I could use a chiffon fabric for the tie. This made the tie graceful - with much less bulk. I had to line the dress with another plain white knit so that it would not be see-through. When sewing with knits it is important to use clear elastic on the shoulder seems and in the seems that connect the bodice to the skirt. This keeps the knits from sagging and pulling on the seams. A Blessing for this new blog, this new dress, this new direction in my life, and especially this spring! Waiting until you were ready to emerge..."
I said I would post the results of the Albion coat contest that I entered. I am putting the link in here so that you can click on it and decide for yourself who you think was the winner and who the group picked as the winner for first, second and third place. http://www.sewalongs.com/vote Here you will find a list of all the people who entered the contest. If you want to see more photos of anyone just click on the photo shown there and it will lead you to all the photos that were available for us to make our decisions. No, I did not win the $2,000 Bernina sewing machine or even get mentioned. http://www.coletterie.com/sewalongs/albion-parade-and-winners. That part is a Bummer. But the good part is even more valuable - I learned a lot!!!!! Time to put on my protective owl coat I made a couple years ago. Really, I feel better already in my magic owl coat! It works! When I entered the contest I told a friend that I knew it was the right thing to do because it would "show me where I stand" in the community of sewists that I have been learning from, buying their patterns, following their blogs tutorials, etc. What I thought it would show me is where I stand in terms of how good of a sewer I am. I had NO IDEA that this was going to be a lesson about where I stand in terms of beliefs and values! I used the same technique for the embroidery here as with the Albion Coat. No, I do not have an embroidery sewing machine! I use a very simple, old 6019 Janome. I use a walking foot and move the felt under it- a quilting method I learned from Ellen Eddy's book called Thread Magic Garden at http://www.ellenanneeddy.com/. The ONLY people who voted on the Albion Coat contest were the sewers themselves. We were not allowed to vote for ourselves. I must admit it was tough to choose who I thought should be the winners because every coat in the contest was really well done! I had to ask myself what makes a piece of clothing a little bit better than the next piece? I made this last fall. It is the Eva Blouse I used the pattern "1938 Blouse" from evadress.com. This took a lot of major adjustments. These Vintage patterns seem to need a lot of modification to fit. I lengthened and widened the bottom part a lot- corset days are over. Added scallops which I learned to do on colettepatterns.com tutorial. With regards to the Coat contest to answer that question I had to choose the people who went one step further than what is called for in the pattern. The people who altered the pattern to make the coat more unique, while at the same time ending up with a cohesive whole garment - that is a step beyond the norm. The people who altered the pattern to make the coat fit well to the body. The people who took the extra time and effort to personalize it with an element of beauty - something meaningful to them like hand made moose antler toggles, hand embroidery, extra pockets, etc. Even if I do not like their particular style it was clear to see who in the coat contest put in the extra learning, the extra effort, the thing that makes a garment truly excellent and beautiful! NONE of the people I chose as the winners even came in the running! this skirt is the Ginger skirt from colettepatterns.com. The waist band is way cool with a scalloped front and I made scalloped pockets with a button. Colette's patterns are really the easiest patterns I have ever made. They usually don't require a lot of adjustments. I got her book a couple years ago and that book is really what taught me to sew! I Still turn to it all the time! WOW! I am so shocked! The coats that the sewers THEMSELVES chose as the winners were the ones that looked most like something you would buy in Macy's, Nordstroms, REI, or some other store where one pays a large sum of money for the NAME BRAND of the coat! Clearly, all of these sewers are talented. Any one of us sewers could go out and buy nice wool coating, machine made toggles, and sew a great looking coat. The leggings are a Kwik pattern #K3988. Recently. I read this somewhere: " You'll look so good that people will not ask 'Did you make that?' they will ask 'Where did you get that?" I thought "OMG! That is NOT for me, I WANT people to say 'WOW! did you make that?!" Why are we sewing after all?!!!! I am reminded that one of the main reasons I am making my cloths is so that I am not imprisoned by the NORM uniform. I am sewing because as a friend said "we are what we wear" and I will wear BEAUTY instead of a dollar sign or some brand name (the social norm). I made a detachable owl hood - I button it on and off- gives me freedom of choice! Thank you to all of my friends who supported me in the making of the Albion coat, who gave me such flattering compliments,thanks to my husband who LOVES his new coat and WEARS it, and all who understand exactly what I am talking about in this post. Bless you all in your small beautiful ways that you do not conform to the nauseating normality that is pushed on us all the time. Thank you for being truly FREE HUMAN beings by responding to imprisonment of conformity with BEAUTY. Here is some of the details of the Albion Coat embroidery. I was not able to get photos of the detail because my camera broke during first shots of Albion coat. I did not use and embroidery machine - just a walking foot, Madeira thread, 58 hours of patience and stiff neck and shoulders. You can read more details about how I did this on the Albion Coat post. This coat is in memory of our magnificent star dappled grey-blue magic horse. He made us laugh, reminded us to play even in our work, helped us believe in blue magic horses, and taught us a deeper meaning of responsibility as the fox taught the little prince. We know that he is now in the night sky giving the little prince and the fox a ride back to the rose. This week I made a simple long sleeve knit shirt. AND I got a new camera because the other one dies during the photos for the last post!!!! As you can see I am trying to figure how to use the remote clicker etc! I finally found the knit tee that I love! I have tried several patterns but nothing was right. So. I took my favorite long sleeve tee and lay it out on cardboard tracing around it and made a pattern. Yes, I like the sleeves to be short so they don't get in my way! A dart on both sides at breast gives it more shape. Using clear elastic strip, or stay tape, or interfacing on the shoulder seams only REALLY helps knits keep their shape. I do things the hard way so it wasn't that simple. I spent years, yes years trying this and that making a lot of tees that I did not like. Finally, about a year and a half ago I started to actually read and then fallow instructions on patterns. I am learning a lot. Making a neck band and securing it with top stitching or a zig zag stitch keeps everything from stretching out. I made the skirt and the leggings earlier this winter. It fits great and is comfy! I LOVE this skirt! It is a Hummingbird Skirt from Cake Patterns sewingcake.com. This is not the last one of these you will see me make! 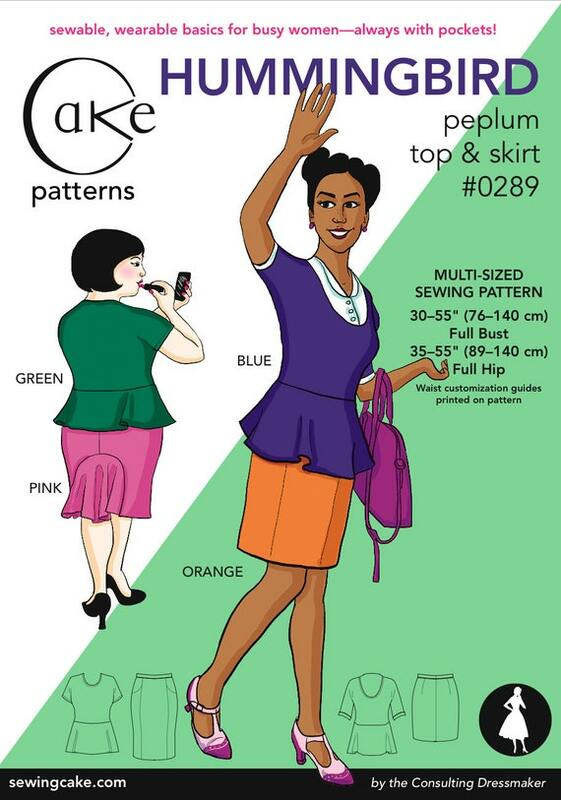 The picture on the pattern doesn't look like much but The skirt is perfect! I used a stretch corduroy and lined it with a stretch synthetic knit. I learned that it is important to have a lining so that the skirt won't stick to your leggings! I hate that bound up static feeling! I was surprised that I could move well in this skirt! and the stretch corduroy makes it so it is not tight around my waist when sitting etc. Now I line my winter skirts- ones I will wear with leggings- to keep the skirt from sticking to the leggings. It took a lot of failures to get a nice invisible zipper. I love the feather in the back of this skirt because it creates a nice shape and allows for real movement! The leggings are ooh la leggings from Papercut patterns. They are also great but I am not ready to show them without a skirt and I have not quite perfected them the way I want so there will be plenty more of them to come.